Very nice beer, even if the flavors are a little different. My overall take here is of dry Scandanavian licorice complemented by cherries- which my wife thinks is a bit like cough syrup, but I like. Don't get her wrong, she doesn't mean overly sweet and medicinal, just that the licorice and cherry combo reminds her of those flavors. Not me, and everything mellows and harmonizes a bit as the beer opens up as it breathes. It ends up becoming downright silky, with a persistent fruity cherry background and roasty licorice and malt notes throughout. Quite pleasant. A delicious variant of one of the best imperial porters around. Tastes like an IBB with sour cherry juice blended into it. Nothing artificial coming out of the nose or taste: balanced. A: The beer is jet black in color and poured with a half finger high dark tan head that died down, leaving a thin layer of bubbles covering the surface and a collar around the edge of the glass. S: Light aromas of dark bittersweet chocolate are present in the nose along with some hints of sour cherries. T: The taste follows the smell and has flavors of bitter chocolates along with notes of roasted malts and hints of sour cherries. Only faint bits of alcohol are perceptible. M: It feels a bit more than medium-bodied on the palate and has a moderate amount of carbonation. O: This beer drinks a little more than an American Double/Imperial Stout compared to an American Porter given its fuller body and richness of the flavors but is still extremely easy to drink considering its strength as it hides its alcohol very well. This one is pretty great. Tons of great flavor and nice cherry on the finish. It is a little thinner than I thought it would be, but still delicious. 22oz bomber with no freshness date. Served in a friggin awesome 22oz snifter. Appearance: Pours black with &lt;1 finger of a dark tan head that settles into a thin ring. Body is completely opaque. Taste: Combination of malt sweetness and a slight tartness upfront followed by roasted malt, dark chocolate, vanilla. Other than the previously mentioned tartness, I'm not really getting any cherry character. Mouthfeel: Full bodied, creamy mouthfeel. Medium fine carbonation. Booze is masked well. 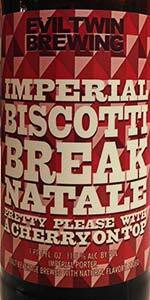 Overall: A good beer, but falls way short of the regular Imperial Biscotti Break. Worth a try if you see it, but not worth seeking out. Sweet bready taste with chocolate malts, bitter coffee, and a sour finish from the cherries. The alcohol is well hidden beneath the overwhelmingly good favours this beer has to offer.